111. CAPTAIN COOK. Issued by J. Wix & Sons Ltd. (1937). Card number 13 from a set entitled "Builders of Empire". Size: Ca. 2.78" x 1.6". Recto: Portrait of Cook. At bottom: CAPTAIN COOK. Verso: BUILDERS of EMPIRE | A SERIES OF 50 | CAPTAIN COOK | (1728 - 1779) | (National Maritime Museum) | The genius of James Cook was quickly recognised after he had joined the Navy as a common seaman in 1755. 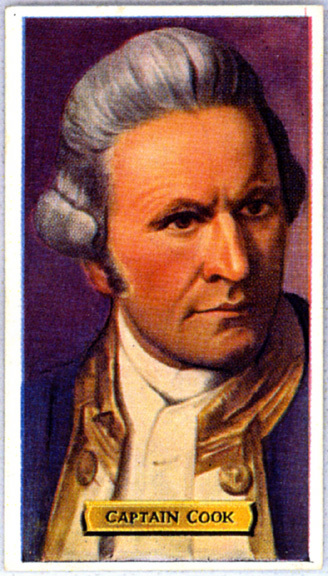 In command of the Endeavour from 1768 to 1771, he charted the coasts of New Zealand and Eastern Australia, naming the latter "New South Wales." In the Resolution from 1772 to 1775, he discovered and charted many Pacific Islands and skirted the Antarctic icefields. On this voyage, by giving his men vegetables and fruit juice, he proved that scurvy, the dread of all sailors, could be conquered. In the Pacific from 1776 onward, he made discoveries including the Sandwich Islands (Hawaii). Calling again at Hawaii in 1779 he was murdered by the natives. He was Britain's greatest navigator, and his achievements resulted in the founding of Australia and New Zealand. | NO. 13 | Kensitas - the MILD cirgarette | "Just what the Doctor ordered"